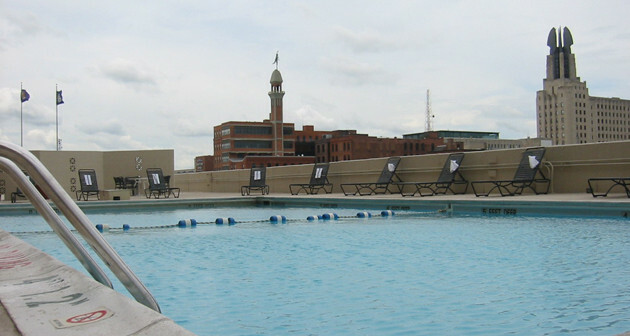 Rooftop Pool Party: Celebrate End of Summer, End of Week. unwind as the week winds down. WHAT: Swank, Swag, Shopping, Sport, Summer, + Service. WHEN: Thursday, August 21. 5-9PM. Let’s start with some FAQs. You throw after-work pool-party into the mix, and suddenly all of our adult-isms completely take over. As. If. 1. How should I dress? You’re probably coming from work. Ladies: 3 Letters – LBD. Or another-color equivalent. The idea is a sleek dress or skirt + blouse you feel comfortable enough in all day that easily transitions to night. What helps with this transition? Blazer or wrap to keep it cool + cozy. Men: Sleek slack, tie-less button-down. Or, bust-out that white T you wear beneath the button-down. Cannot go wrong. 2. But it’s a pool party! What now? Listen. I’m brining my bathing suit. If there’s a pool, and it’s still hot like the projected 81° daytime temp indicates, and there’s a pool on top of a roof with a downtown view. … You can’t ignore a good pool. It doesn’t mean you have to get in. It doesn’t even mean you try and combine beachwear with after-work evening attire–this isn’t Miami + congrats to the person who does pull this off–but it does mean you are prepared. 3. What should I expect? Soiree. Shindig. Carnival. Backyard BBQ. I am not the organizers of the event, but this is my take. This is a cocktail party that also has a beer-toss Dress for Success fundraiser. (Let that juxtaposition settle-in.) This is an after-work get-together filled with cigar-rolling + loads of premier #shoplocal shopping. True there are no rides nor corn dogs involved, but there are lawn games. And food, and vodka, and spa services, and–oh yes–a DJ. Swank. Beauty and Pampering for Men + Women: Mini manicures, massage and a full service braid bar over cocktails. 1. Allora Salon and Spa’s full service braid bar will be on-site for gorgeous tresses. They will also be offering mini manicures and chair massage. 2. Shear Ego Salon and Spa will be offering mini manicures, chair massage, and colored hair chalk – a quick splash of color on several strands of hair that washes out in 2-10 washes. 3. Men, there’s something for you, Shear Ego Men’s Club will be offering MANicures and complimentary nose waxing. One of their male clients’ favorite services! 4. Jamberry Nails will be offering complimentary nail wraps. 5. Motives Cosmeditcs is known for their quality cosmetics offered at affordable prices. Motives will be sharing their expert makeup tricks, tips, and providing demonstrations. A woman’s dream come true. $5 braids, $15 manicures, $10 hair chalk. Shopping. Just basically my all-time favorites. And if you don’t know them, they will be yours, too. –Artwark: Inspired by elements such as culture, nature, religion, and love Artwark features handcrafted cutting edge jewelry with a personal touch. –BeBe Mills: Nestled in the village of Brockport, BeBe Mills carries contemporary clothing and fashionable accessories for women of all ages. –Christine and Co. Design specializes in one of a kind glass pendants designed by local artisan Christine Meyer. –Dragonfly Jewelry: Dragonfly Jewelry provides unique customizable handmade beaded, leather, wire wrapped, and chainmaille pieces. –Lucends: Handmade by artisan Lucinda Snyder, Lucends has an array of totes, clutches, and cosmetic bags in colorful prints and exclusive fabrics. –LuLaRoe: Style meets comfort with LuLaRoe’s mobile boutique of maxi skirts, pencil skirts, dresses, and leggings for both women and girls. –Panache Vintage and Finer Consignment will be hosting a pop-up shop of designer and boutique label women’s vintage and finer consignment luxury resale. –Jonelle Maria’s namesake handmade jewelry line is filled with eco-friendly minimalist pieces that take inspiration from geometric patterns, nature, and tribal silhouettes. –Claire-Flair features one-of-a-kind, handmade vintage-inspired accessories guaranteed to add some glamor to any ensemble. –Machinator Chaos specializes in creating one-of-a-kind Industrial, Steampunk and Victorian jewelry and accessories made from everyday materials. –Penny’s Lotions and Potions is a natural skin care haven. All of her products are all-natural, contain only a few ingredients, and are safe for sensitive skin. –Stella and Dot Stylist Krista Jaekle will be showcasing their irresistible line of boutique fashion jewelry and accessories complete with a preview of fall jewelry trends. Bombay Bangles – Bombay Bangles jewelry is handcrafted in India, drawing upon eastern colors and styles for pieces that truly make a statement. Origami Owl: Origami Owl representative Carlyn will be bringing her jewelry bar filled with unique charms, lockets, earrings, and chains. To Your Measure – Ensuring comfort and a flattering fit, To Your Measure creates custom pants designed to fit your unique body measurements. Treasure Trove Vintage – Treasure Trove Vintage will be providing attendees a glimpse at their collection of quality vintage pieces ranging from the 1900’s to the 19990’s. Transit Apparel: Created by local artisan Matt Rodgers, Transit Apparel’s line of t-shirts feature exclusive prints that reference Rochester’s heritage and its historic subway system. Thirty-one – Consultant Rebecca Haley will be showing off their assortment of cute and functional bags, wallets, totes, and home accessories. CAbi– Featuring women’s clothing for both career and casual wear CAbi inspires women to build a style by mixing and matching pieces with the way they live. Carrie George – Handmade leather bags and accessories designed and made by local artist Carrie George. Nerium skincare provides natural skin therapy solutions with day and night creams to promote younger-looking skin. *Stop by the Hype Booth to capture the night’s memories on film. *TREE Vodka signature cocktail sampling. Anyone with a pre-sale ticket gets their first cocktail on the house. *Treat yourself to a guilt-free Sample of Vemma’s insanely healthy energy drinks. *Sample Eat Me Ice Cream’s inventive flavors made with local, organic ingredients. Summer. It’s a Pool Party on a Roof, Downtown! What other summer pool parties do you have to go to right now? Service. It’s all for a Great Cause. –Great Brewers will be offering a craft beer tasting. Win a selection of 24 craft beers at the Beer Toss forDress For Success. Eat Me Ice Cream! Jonelle Maira Jewelry. Treasure Trove Vintage. A (female) DJ Annalyze. Hype Booth. Poolside! And more. Buy your tickets now, guys. It’s gonna’ be hot. « Treasure Trove Vintage feat. Anjolee DeMaroux Photography: Curated Vintage.